Over the last week, so, so much knitting has been accomplished in the wee hours. Antrorse is finished and blocked, it and my head wrap are waiting for buttons, and I'm almost finished with a replacement for the hat of shame. Even though I don't like leaving things incomplete, (Heh) I'm setting them aside to swatch and cast on for the Eastwood Cardigan. The knitalong has started and I feel a little behind since I haven't even messed with my yarn or picked a needle size. After finishing my swatch, I decided to use size 2s. Can you believe it!? I'm kidding. I always use size 2s, unless they've all got a work-in-progress on them. Then I use size 1s or 3s and knit in such a way that it will seem like I used size 2s. Those needles seem to be in my hands constantly. I could be Michelle Addihands, like Edward Scissorhands, only with size 2 Addis projecting from my nuckles. No one would even notice. 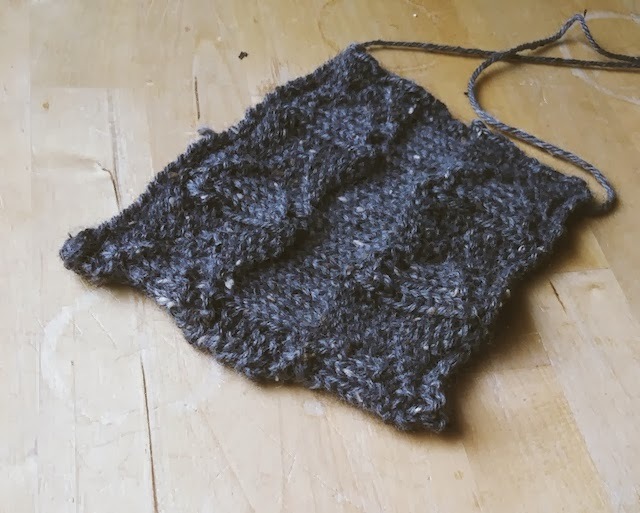 I was measuring the gauge in stockinette stitch, but I'm trying to make my swatches somewhat interesting to sew together for the my swatch sampler blanket. So, I'm going to try and include a design detail of the thing I'm knitting in each swatche. However, I just realized, the arrows are on the wrong side... but whatever.... I'm casting on and that's all that matters! 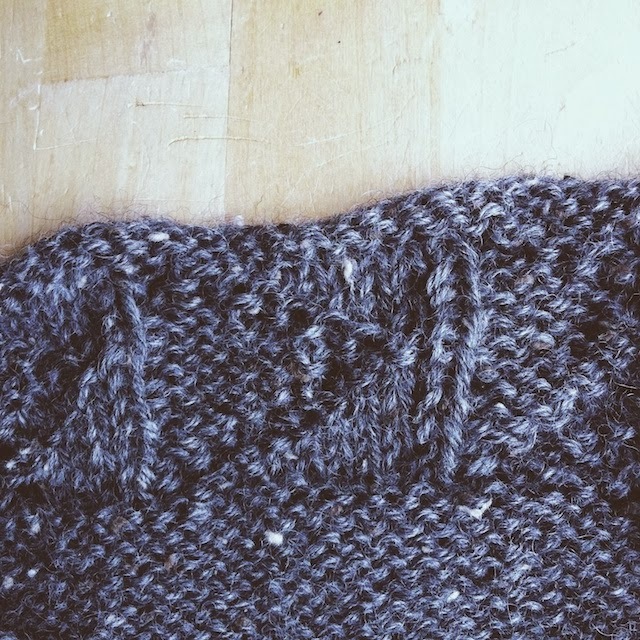 I have exactly one hour in which to start one of the front panels of this cardigan. You can insert eeep, squee, gah, or any other onomatopoeia you prefer. I'm keeping mine all on the inside. Oh my gosh! I can't believe I wasted this much of my knitting time making Addi Hands. Also, could my hands possibly look more elderly? Haha Addi hands. Love it! I've just cast on, and in 4.5 mm (US size 7s, I believe). Are you really doing it on 2s?! I'm not sure if you're actually kidding or not. lol! I'm only a few rows into the pattern on the front panel, and I already love it! Plus I just got my new metal Knitter's Pride needles in today, and I'm already noticing a change in my speed using them. They're definitely smoother than my Knit Picks Harmony's (or whatever they're called now), although I love the woods. But I need all the help I can get to go faster this knit along. Although...I guess I should've re-swatched using them... uh... WORKING ON A BIG SWATCH! How do you like the tweed? hahah Giggling about the elderly hand comment :) That's one thing that knitting seems to do to us! I never even thought of that, Kelly. My hands have looked this way since my twenties so I always thought of them as bony. But maybe they're really just ripped!!! As in, " I will crush you with my buff knitting fingers!" Huh, that's pretty interesting. I know you mentioned knitting loose, but I don't really know US needle sizes, so I didn't realize just how small of needles you've been using. INTERESTING. I love interchangeables! I found it a really easy way to get a large range of needles with different cable lengths when I was just starting off. But I started with cheap horrible Walmart fixed circs in very limited sizes, and then my next big knitting purchase was a set of Harmony interchangeables, and it was love at first sight (and just destiny when I started knitting with them). I only used my cheap horrible Walmart (or I guess it's Red Heart brand) fixed 16" circs for hats, but they only had 3 sizes and the joins are horrible. I finally broke down and bought the 16" interchangeables this month (and got them yesterday). And since I know Knitters Pride works with Knit Picks, it was an obvious option. I love that I can mix-and-match the two sets as needed. I'm really liking the hollow metal needles (and yay beautiful smooth joins)! I think it depends on what you need and use. If you knit so loosely, it might not be worth getting a larger set that includes larger needles that you may never use. 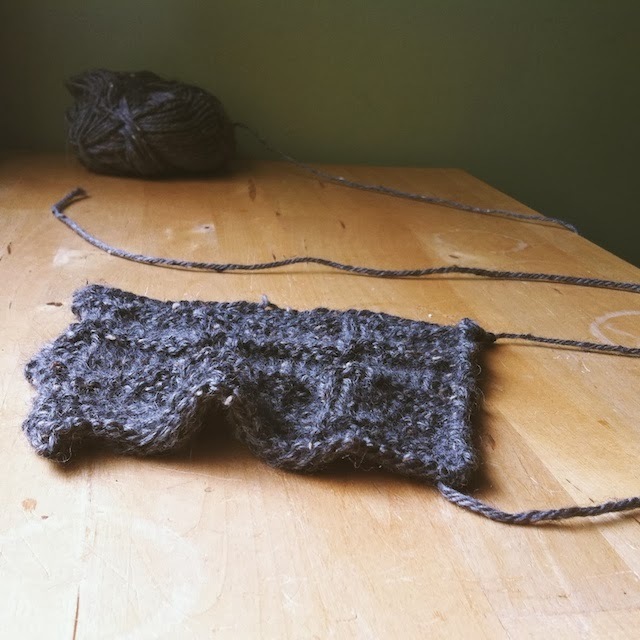 I'm a relatively tighter knitter (unless I consciously think about it) and I use pretty much the full size range (except the very largest size - so far). It's good value for me. Just something to think about, I guess. "Oh my gosh! 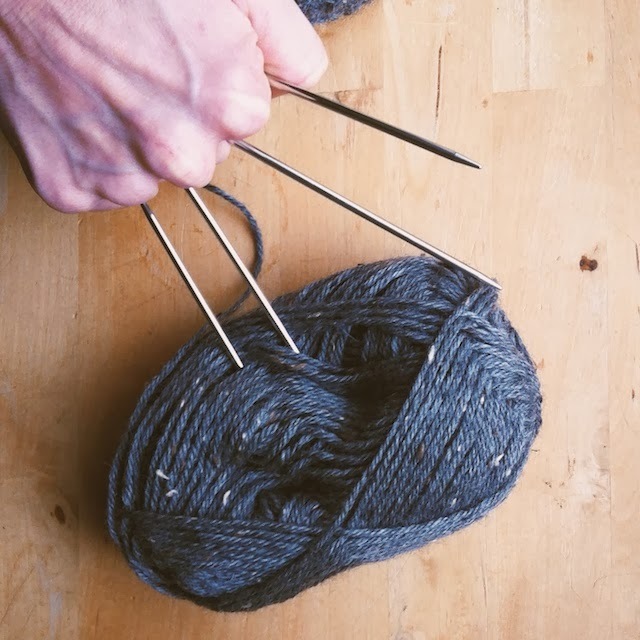 I can't believe I wasted this much of my knitting time making Addi Hands. " I love reading books in my blog!! Ha! I think you're right about it not being that important for me to have interchangeable a if I tend to use the same few sizes. I do have a set of Denise needles that I used like crazy when I knit more tightly. So, I still use them for larger sizes. They also rotate and click.